Very quickly because I’m in the middle of bashing at this chapter, but saw this today and thought it was interesting (I am nothing if not predictable): In pictures: Suffragettes storm the Houses of Parliament for feminist lobby, with more background on it from the Olympics Opening Ceremony. In the months before the ceremony, the women forged a particular bond – with each other and the women they were representing. So when the experience ended, what did the Olympic suffragettes do? They kept marching. Dozens of suffragette performers, led by Helen Pankhurst, great-granddaughter of Emmeline Pankhurst, plan to march on parliament, at the vanguard of a major feminist rally organised to urge MPs to stop “eroding erosion of women’s rights” and make more progress on women’s equality. No longer under the guidance of Boyle – who included the suffragette section in the ceremony after becoming enthralled by the memorial plaque to Emily Davison, found on the back of the broom cupboard door where she once hid in the House of Commons – the group may treat observers to a scaled-down version of their performance. It may even include the critical moment, which to the annoyance of many wasn’t featured in the TV coverage, when the women formed a human scaffolding to carry a Christ-like Davison above their heads. I find it fascinating because it demonstrates present day understandings of suffragettes very clearly. One of my chapters has the working title “Public figure and private nuisance: the problem of Emily Wilding Davison” and focuses on discourses of Davison and the WSPU in the days and weeks after her actions at the 1913 Derby. Davison, the WSPU’s wild child, often acted unpredictably and in ways that challenged the autocracy of the WSPU leadership. However, her actions were often innovative and headline grabbing – none more so than when she was struck by a horse at the 1913 Derby. 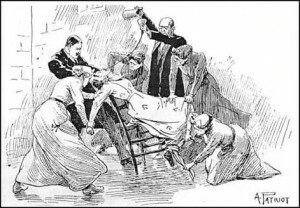 I argue that the newspaper representation of this shows the WSPU bringing her under their aegis so they could make her their martyr. Davison occupied an interesting and complicated place within the WSPU and the wider suffrage movement, so I find the image of a “Christ-like Davison” intriguing. I also want to find out more about remembering and history and what it means to summon these ghosts and remake them for present day issues, but that will have to wait until after I submit. The video I discussed in my last post has got me thinking about wider issues in how and what we teach about the suffrage movement. What is discussed and disseminated about the suffrage movement is a political issue; what we teach, and in doing so deem important enough to pass on, probably says more about us and our priorities than about the suffrage movement. Passive forms of resistance – for example, the chaining self to railings issue, which as far as I can tell from my data was either systematically underreported to the point of invisibility (unlikely, given news values) or didn’t happen with any frequency – is widely discussed and disseminated today. Forcible feeding is another issue widely discussed now. Part of this is because hunger strikes have a resonance today – as a child growing up in Britain I knew of Bobby Sands, and over the past days I’ve read of Abdulhadi Al-Khawaja of Bahrain and the Palestinian hunger striker Khader Adnan. Emily Wilding Davison’s death is also widely discussed in present day material, despite it not being sanctioned by WSPU leadership and ambiguous as to her intentions – it’s probably among the best known acts of the suffrage campaign. It’s dramatic, but then so was lots of other suffragette direct action – planting a bomb in David Lloyd George’s unfinished house for example. I’d argue that what these models of resistance have in common is their emphasis on female passivity, injured female bodies and the pain and humiliation suffered by women; as Laura Mayhall says, they’re about the “individual exhibition of women’s bodies in pain”. It’s an image of the woman as martyr, who experiences personal agonies in order to bring about social change. And I think there’s something damaging about that – it teaches children, girls in particular, that the way you protest is through personal suffering. It’s protest turned inward; the depth of your resistance shown through how much pain you are willing to bear. I don’t think that’s a healthy thing to represent as the extent of suffrage protest. The suffrage movement campaigned through political channels (petitions, deputations, canvassing MPs), peaceful protest (demonstrations, rallies, public speaking, tax resistance), the arts (writing, drama and visual arts) and militant direct action (window breaking, attacking politicians, arson). There were multiple channels of resistance and I think it’s important that these are taught. To me, this says something about how imaginative and diverse protest can be, the many forms it can take and perhaps something of the importance of these many types of campaigning. In these heady times of austerity cuts and the rise of co-ordinated grassroots anti-cuts groups, I think it’s important that we’re aware of the rich history of democratic protest and its potential to effect change – not as single, isolated, dramatic events, but as a narrative of resistance.